To clean and disinfect heavily soiled surfaces apply a solution of up to 1:100 by spraying, mopping, brushing or through a pressure washer. Always allow 5-10 minutes contact time before rinsing. 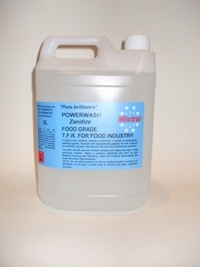 For lighter cleaning dilute up to 1:200 with water. When using as a sanitiser after degreasing dilute 1:200 with water and spray over surface. Leave to air dry.